In America's most dangerous and poorest city, Camden, N.J., bullet holes are visible in a church's stained glass window, crosses commemorating the murdered line the outside of city hall and the police staff is so outnumbered and outgunned, drug deals occur in the open. Rock Center's Brian Williams visits Camden and talks to those fighting to turn around the forgotten city. But the decades since have not been kind to Camden. Today it is the poorest in the nation. Directly in the shadow of the glittering skyline of Philadelphia, Camden has long suffered the indignities that poverty breeds. A drive through the streets of the 9-square mile city reveals a moonscape of crumbling infrastructure and abandoned homes, nearly 4,000 in all. “I always think of Camden as the best visual aid in America to see what has gone wrong and what is going wrong,” said Father Michael Doyle, who has been serving the city’s poor from his Sacred Heart Church for more than 40 years. Camden was once a manufacturing boomtown, home to RCA Victor, Campbell’s Soup and the biggest shipbuilding company in the world. But once industrial jobs began drying up decades ago – as they did in so many other cities across the United States – many people left for greener pastures. Then came a crushing blow: the race riots of 1969 and 1971, which left the city mortally wounded. In the decades that followed, civic corruption and mismanagement rendered Camden increasingly poor and violent. Three mayors have been indicted in the past few decades, adding to the sense of hopeless among residents. Last year was the bloodiest in Camden’s history; the city of just 77,000 had 67 homicides. On average someone was shot every 33 hours. Distraught over the level of violence, the community erected crosses on the lawn of City Hall to try and draw attention to the crisis. Thomson said crime rates have gone up because he has fewer cops. In early 2011, unable to fund its obligations, the city cut the police department in half, leaving roughly 200 officers to police one of the most violent cities in the country. 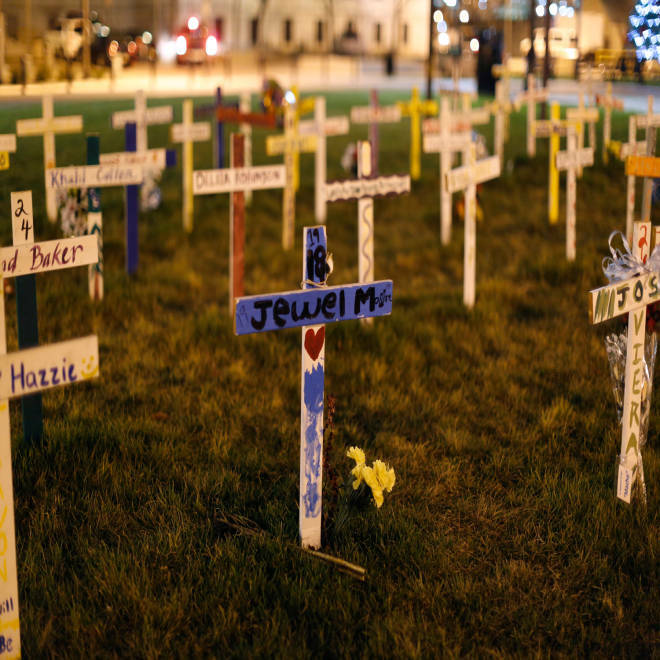 Crosses on the lawn of City Hall mark lives lost to violence. There is movement to get more officers on the streets. In April of this year, a new county force will take over for the City Police Department, adding 200 officers to the ranks. The decision to regionalize the force enraged the Camden Fraternal Order of Police, which has charged the city with union busting. “The experienced officers are the best chance they have to provide safety to the public,” said FOP spokesperson Nancy Webster. Chrissy Rodriguez, who lives on one of the most violent streets in the city, worries about her two young boys constantly. But it’s hard for people like Rodriguez to scrape together enough funds to leave. Roughly 30 to 40 percent of Camden’s citizens are out of work. Rodriguez has only been able to find a part-time job, which brings in about $700 a month. About 42 percent of Camden’s population lives below the poverty line, with the average income hovering around $26,000 a year. That is in stark contrast to the rest of New Jersey, where the average household income is $71,000 a year — the third highest in the nation. The Rev. Michael Doyle, who has been serving the city's poor from his Sacred Heart Church for more than 40 years, tells Brian Williams there is hope for the city of Camden. The “walls” of Camden hold in a population that is 48 percent black and 47 percent Hispanic. The city is trying to revitalize. Old buildings along the waterfront have been turned into luxury condos. Cooper Hospital and Rutgers University have created stability on handfuls of blocks. And recently Cooper opened a medical school. Still, the main industry remains the drug trade and it’s been so bad for so many years that the city’s tragedies often seem to go unnoticed. Camden’s got heart. And you’ll find that heart in community leaders like Tawanda Jones. Better known as Ms. Wawa, Jones is the leader of the dance troop the Camden Sophisticated Sisters Drill Team for school-age girls. “There's a lotta people from Camden that are so gifted and so talented,” said Jones. Jones has been volunteering her time for more than 25 years. She raises money to help the team travel, visits the children’s schools on her days off, and dedicates herself four nights a week, all year round to creating a safe space for children. “We practice all year round cause there’s danger all year round,” said Jones. For now, through the efforts of people like Jones, the City Invincible marches on. Camden's got heart. And you'll find that heart in community leaders like Tawanda Jones. Better known as Ms. Wawa, Jones is the leader of the dance troop the Camden Sophisticated Sisters Drill Team for school-age girls.